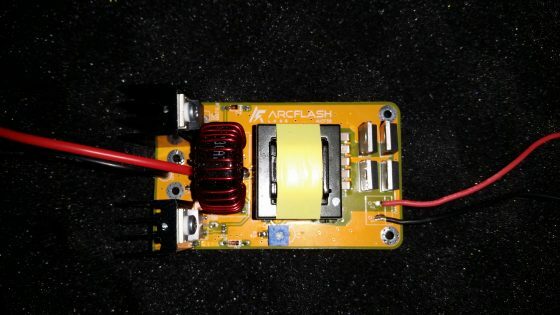 The Arcflash Labs HVFC60 is an ultra-compact, high power, battery (12-25V) to 1000V quasi-resonant DC to DC flyback step-up converter. Its inputs and outputs are NOT isolated with respect to ground. 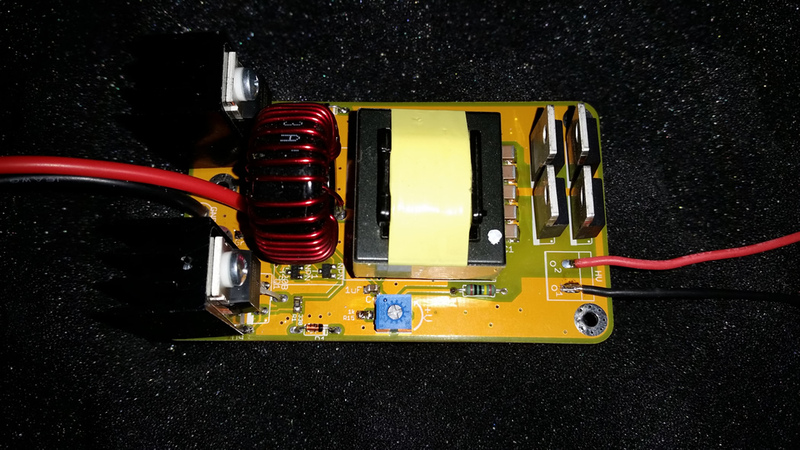 The HVFC60 is an improvement on Arcflash Labs’ HVFC50 unit, boasting output voltage up to 1kV and 50% higher output power using an optimized layout and a silicon carbide (SiC) rectifier bridge. 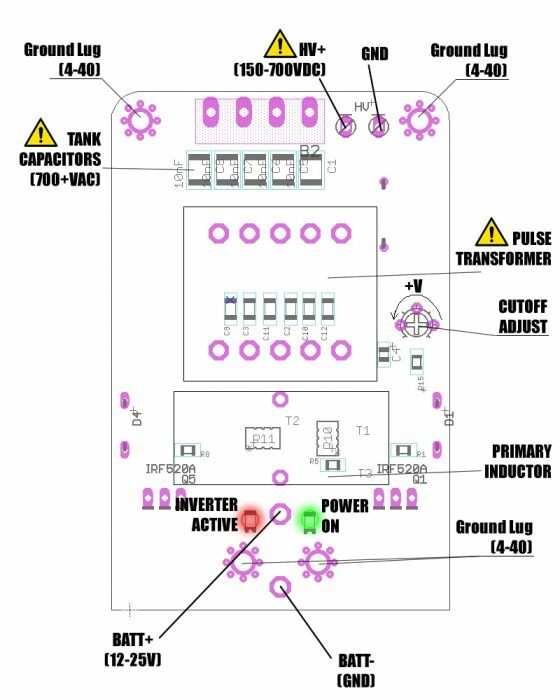 The unit is designed to handle input voltages up to 25V and a dead-short condition across the high voltage terminals for short periods of time (<10s). The HVFC-60 is the most powerful commercial battery-operated capacitor charger in the world. Similar units operate with an older of magnitude lower output power and/or efficiency. 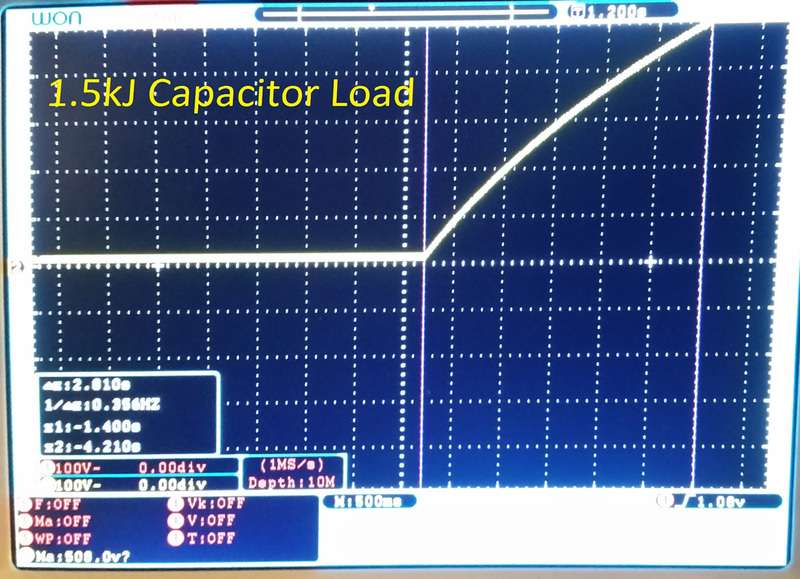 The HVFC60 is capable of charging one 12mF capacitor bank up to 500V in under 3 seconds. The unit also features a hardware cutoff voltage trimmer which can be adjusted to set the maximum hold voltage. This feature is especially useful in a capacitor charging application as the unit can charge a capacitor up to its maximum rated voltage and will automatically shut down, start up, and hold the capacitor at its set voltage indefinitely without exceeding the setpoint. While it is not recommended, the HVFC60 can also output high frequency, high voltage and high current AC for use in portable welding equipment such as portable TIG and MIG welding designs by tapping the outputs of the primary transformer. The HVFC60 is also ideally suited for use in a portable defibrillator application. Its very high voltage makes it a potential replacement for a large bulky capacitor bank in a portable defribrillator. Higher voltage transformers may be installed if unit is ordered in bulk. Simple operation: DC high voltage automatically turned on when low voltage DC is connected. Independently heatsinked MOSFETs for optimal thermal characteristics. It is the responsibility of the End User to ensure compliance of the product with all federal, local, and state laws. This product is intended as a sub-component for industrial systems only. NOTE: THE HVFC60 IS FCC EXEMPT UNDER 15.103-h AND IS NOT UL-LISTED.